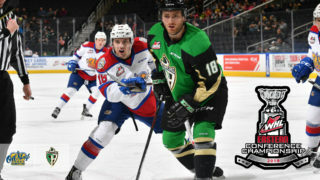 Zach Russell scored the game’s opening goal and assisted on Wyatt McLeod’s overtime winner as the Edmonton Oil Kings (7-2) defeated the Calgary Hitmen (4-4-2), 2-1, in front of a crowd of 3,278 at the Scotiabank Saddledome on Tuesday night. 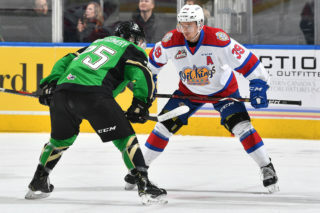 The Oil Kings lead the best-of-seven Eastern Conference Semi-Final playoff series, 3-0, and have a chance to close out the series in Game 4 tomorrow night, Wednesday, April 10 at the Saddledome at 7:00 PM MT. Russell’s big night added to the success and demonstration of depth by the team as whole, as the club has enjoyed offensive output from 18 players who have managed to factor into scoring through the team’s first nine games of the postseason. As inspiring as the depth of scoring has been, so too has been the defensive play of all rearguards, along with the last line of defence – the team’s goaltending – which continued to be impressive in Game 3. Dylan Myskiw (4-2-0) earned his third straight win, turning out a near unblemished performance before the Hitmen managed to etch the scoresheet with a late 6-on-3 goal to tie the game. 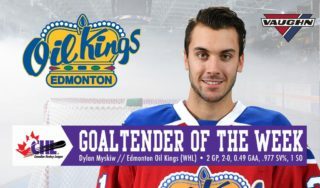 Myskiw made 24 saves on 25 shots, improving his record against the Hitmen to 8-0-0-0 dating back to the regular season. His counterpart Jack McNaughton (4-2-4) surrendered two goals on 29 shots in the team’s fourth overtime loss of the postseason. 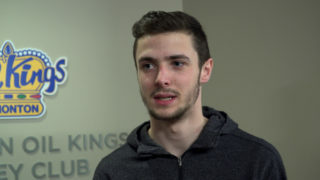 It was 7:57 of the second period when Russell opened the game’s scoring, notching his first of the playoffs in his second game after being inserted into the lineup in Game 2, assisted by Quinn Benjafield. Shots on goal in the scoreless first period were 6-6, and 16-11 Edmonton after 40 minutes of play. 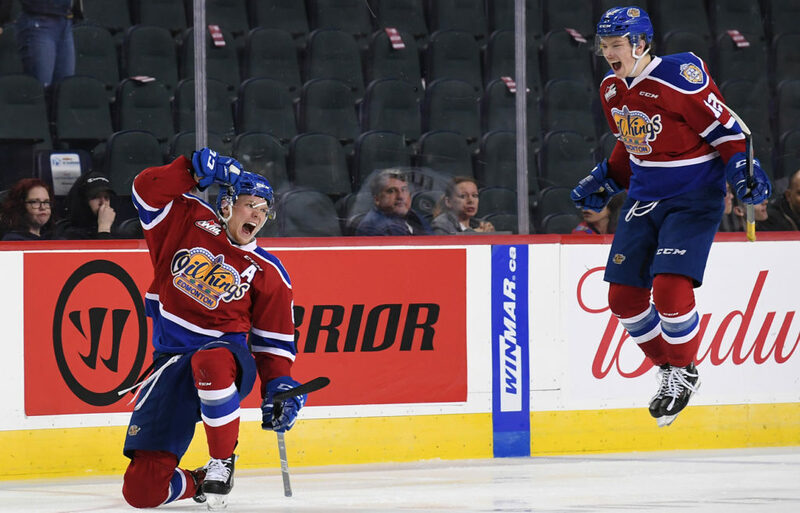 In the third, the Oil Kings continued to control the pace of play despite being called upon to kill off a last minute second period penalty, and another approaching the midway point of the third. 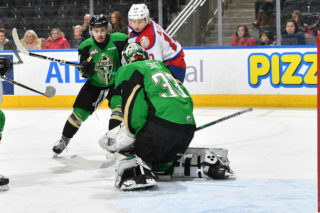 As anticipation and anxiousness mounted with the Oil Kings maintaining their 1-0 lead nearing three minutes left in the game, the visitors were whistled for cross-checking, then 1:27 later called for tripping, giving the Hitmen a 5-on-3 opportunity and a chance to tie the game. With McNaughton pulled in favour of an extra skater and Calgary on a 6-on-3 man advantage, they potted the equalizer to make it 1-1, and eventually send the game to extra time. 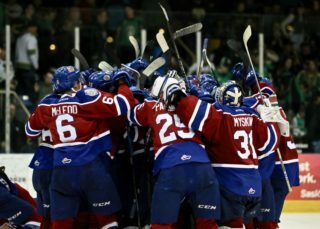 The Oil Kings successfully killed of their remaining 21 seconds shorthanded in the extra frame, then moments later, after gaining the Calgary zone, McLeod unleashed a blast from the left point that beat the Calgary netminder to give the Oil Kings the series stranglehold at 2:46. Shots on goal were 8-6, Calgary in the third period, and McLeod’s winner was the lone shot on goal in overtime. Calgary was 1-for-5 on the power play, while Edmonton finished the game going 0-for-5 with the man advantage. Zach Russell (EDM) (3), Jack McNaughton (CGY) (2), and Dylan Myskiw (EDM) (1) were selected as Three Stars of the Game.